It was 12.30 on a sun-soaked afternoon in Hale. General Motors might be on its knees, the House of Commons might be corrupt, but on this day that didn’t matter because 36 of St Ambrose’s finest were gathered for the 12th St Ambrose Golf Society Open. Starting with bacon butties and burgers (of course home-made, of the finest finely chopped fillet steak) to sustain them over a gruelling two circuits of the 9 hole course. Fitz had of course, done the business. He had personally arranged the perfect weather, and that magical combination of great catering, great organisation (thanks to Bernard “Bono” O’Neill) and of course great company that promised a superb sporting afternoon and evening. It was a Mad Dogs and Englishmen sort of day. Nine teams, ably organised by Bono, were launched into the merciless heat. The team sheets featured famous St Ambrose golfing names, former winners including Tully, Quiligotti, Kennedy and Kelsey. Some had wisely taken advantage of the legendary rehydrating properties of the draught Banks’ bitter, amply available from the bar. It was not going to be easy, after all. Like the Champions League itself, the St Ambrose Golf Society Trophy has never yet been retained. As well as competing for maximum team and individual points over 18 holes, there would be additional prizes for theStraightest Drive, Nearest the Pin, and for extra comedy effect, a Putting competition directly in front of the club veranda. Knobbly knees (perhaps not seen at Hale since our Cross Country runs twenty years earlier) were once again on display. Yes, the St Ambrose Golf Society was definitely back. progress over the first nine holes, and manfully bypassed the Clubhouse bar, moving directly onto the 10th and the straightest drive, hot on the heels of the recently launched Team 9 (Riley, Harper, Wright and Wilkinson). Team one were clearly taking this very seriously. Team 3 were next in, Fitzpatrick, Gavin, Dempsey and Kenny, and the foursome sensibly made full use of the facilities, by ordering six drinks and setting a precedent that would stand for the rest of the afternoon. The message “Compulsory drinks!” was called to each team as they putted the 9th. The heat was beginning to tell. “Its going horribly” muttered one member of Team 4, en route to urgent rehydration. And as the teams came in, the conversation flowed through the pain of United’s fruitless pilgrimage to Rome two days previously, suffered most acutely by Paddy Kennedy, who lost his watch, and Simon Quiligotti, who flew to Venice by accident. Dinner was approaching and suddenly people realised that Hale Golf Club rules insist on a jacket and tie for dinner, and no denims. A few had forgotten a jacket or a tie, some popped home, or borrowed a spare tie from behind the bar. Bernard Stafford, had he been there, might have done a roaring trade. But for Dave Pugh, wearing shorts, it was much worse. Malvern is somewhere way beyond Birmingham down the M5, it was 6.45pm, and dinner was approaching fast. Quickly sizing up the golfers, and even after speculating doubtfully on various claimed waist measurements it became clear that the only way Dave could get to enjoy his dinner was via a large detour for a borrowed shirt and tie from his brother in Didsbury, and then a lightning visit to John Lewis’ menswear department for the trousers. And somehow, incredibly, he managed it. Dinner by Mac (caterer Brendan McNamara) was of course excellent: Prawns with Melon to start, Pork, Beef and Ham with Yorkshire pudding, stuffing, vegetables, then Home made Apple Pie and Ice cream, and then Coffee. Dave’s new trousers looked fantastic. It was time to thank the organisers, particularly Peter Fitzpatrick, who masterminded the day, and time to present the prizes to the lucky winners. Team 7’s John Boyle (father of Mick and Kevin) took the prize for the Straightest Drive , “just 1mm from the centre line of the fairway”. 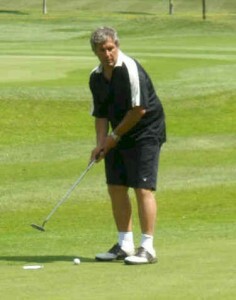 Team 9’s Dave Wilkinson won the Nearest the Pin competition. The team prize was won by Team 9: Peter Riley, Tony Harper, Noel Wright and Dave Wilkinson (“It’s the Warrington bus!” somebody cried. When Pete Riley announced that “the Warrington lads always go home with something”, he was heckled mercilessly). Tony Harper’s (first ever) victory speech included a special tribute to Mark Gallimore thanking him for attending, “because when Mark attends, I always know I’m not going to come last”. Mike Massey won the putting competition and Team 8’s George “Stavros” Tsiantar won the over 19 Handicap competition. Despite being Amanda Holden’s favourite he was to narrowly miss out on the Treble, performing with his son the in the final of “Britain’s Got Talent” the very next day. And then it was the big moment, the overall individual winner. The St Ambrose Claret Jug Golf Society Trophy has never yet been retained (although a lucky few have won it twice). Rick Devine (handicap 16) took the trophy to a storm of abuse/applause. Mike Massey was runner up. Mark Gallimore sportingly took the Longest Walk Award (once again) with a personal best of 10 points and after what was, clearly, a long-prepared speech, celebrated reaching double figures with a refreshing drink of Kaliber. 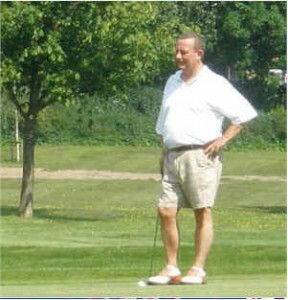 We had enjoyed good organisation, great company and perfect conditions, and as we parted, some heading home, others for the bright lights of Hale, we all looked forward to Peter Fitzpatrick co-ordinating the 2010 St Ambrose Golf Day. Next year’s event has been confirmed as Friday the 28th of May 2010 at Hale Golf Club. If you would like to be added to the database of the St Ambrose Golf Society, to be involved in future events, please contact Peter Fitzpatrick.